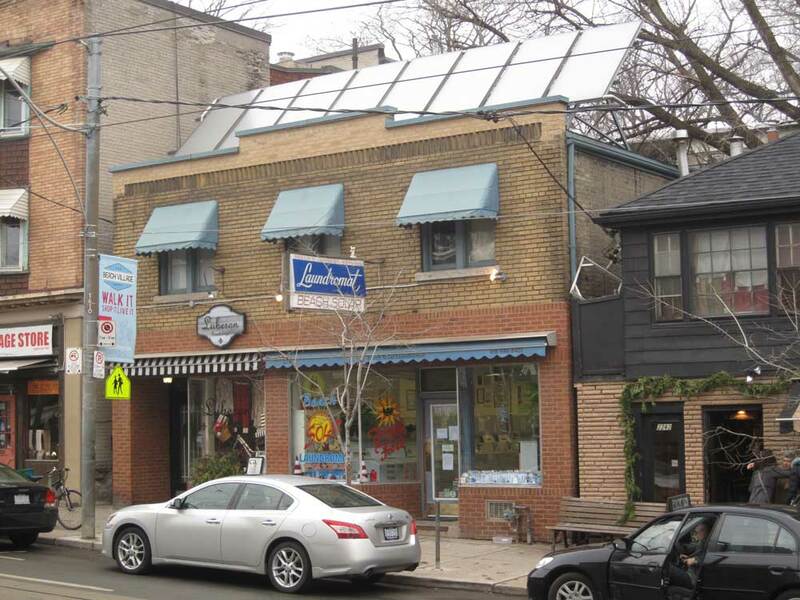 Here at the Beach Solar Laundromat, we’re doing our best to provide a clean, efficient laundry facility in a 65 year-old building with 21st century technology to heat our water, heat our radiators and reduce our emissions. 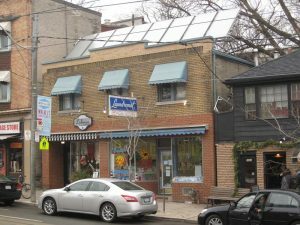 When the current owner purchased the building in September 2002, an oil-fired boiler, dating from the construction of the building, heated water for the radiator system. A 6.0 kW electric water heater provided hot water for the apartment. And a 460,000 Btu/hr commercial boiler, using natural gas, heated the water for the Laundromat. The oil-fired and electric systems were inefficient while there was excess capacity in the natural gas boiler. Working with the engineering experts at Solcan Ltd., plans were made to integrate all three systems. First, the oil-fired boiler was replaced with a heat exchanger drawing energy from the natural gas boiler. And our brick chimney was removed, with the chimney space inside the building used as a conduit for our solar heating fluid pipes. Next, the electric water heater was removed and the hot water supply of the apartment was connected to the natural gas boiler. Solar thermal panels were installed on the roof and the circulator, air purger, pressure-temperature gauges and fill-drain assembly were installed in the mechanical room in the basement. These solar panels heat propylene glycol which, through a heat exchanger, heats the municipal water. A unique air-conditioning system was designed and installed. 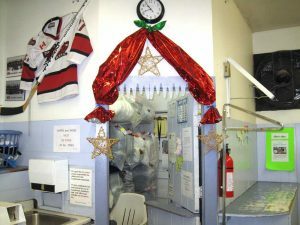 Cold municipal water entering the building is circulated through ceiling mounted coils in the Laundromat, retail store and second floor apartment. Fans pull warm air across the coils, chilling the air and warming the water. Two 100 gallon storage tanks hold cold water for circulation to the apartment during the night, when the Laundromat is closed and no new cold water is being drawn into the building. 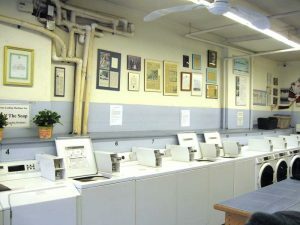 In April 2003, a wash and fold service was started with Neighbourhood Link. Newcomers to Canada are hired and trained by Neighbourhood Link to give them Canadian work experience and to improve their language skills. The Laundromat has enjoyed increased capacity utilization, and enhanced community goodwill. When the building was purchased in September 2002, no data on energy consumption for the building was available. We’ve since learned that the annual heating oil consumption was 7,500 Litres, all of which has been displaced. With our solar system and natural gas burner replacing our inefficient oil boiler for radiator heating, we have significantly lowered our emissions during the heating season. We have collected gas consumption data and our natural gas consumption is down 30% per load of laundry since our solar system was installed. Our removal of the electric water heater has reduced our need for electrical energy from Toronto Hydro, despite the small need for electricity to power the fluid pumps serving our solar panels. We have installed energy efficient fluorescent lights in the Laundromat. Our electricity consumption is down approximately 30% per load of laundry. We have installed a solar water heating system to pre-heat the domestic hot water used in the building and the radiator heating system. Propylene glycol diluted 40% with water, circulates to the solar collectors. Through a heat exchanger, solar energy from the propylene glycol is transferred to the water in a solar storage tank. This water feeds into a second water storage tank backed up by a gasfired boiler. Through a second heat exchanger, heat energy is drawn off this second tank to heat the building’s radiators. Our air conditioning system circulates cold municipal water through ceiling mounted coils, chilling the air and pre-heating the water. There are no refrigerants, compressors or exhausted heat in our air conditioning system. Our Building was recognized as Best in Canada, Small Business Pollution Prevention and Greenhouse Gas Emission Reduction by the Canadian Council of Ministers of the Environment. Canada supported the solar installation through NRCan REDI. Our Wash and Fold service was recognized as Best in the World with the 2004 Bremen Partnership Award.